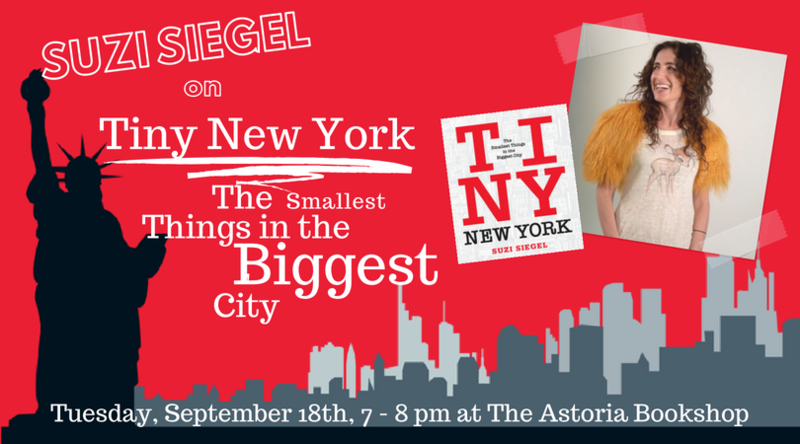 Join Queens local Suzi Siegel for Tiny New York: The Smallest Things in the Biggest City. While New York may be famous for its towering skyscrapers and colossal neon billboards, it turns out it’s actually the little things that tell the real New York story. 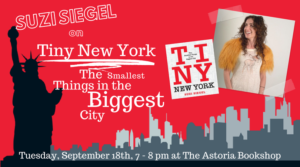 Suzi Siegel, who is little, grew up in a little apartment in the Bronx. She is a former investigative reporter and travel writer. Thus, she is uniquely qualified to write a book full of words about the tiny things in New York City that might have otherwise gone unnoticed. Siegel has worked as a crime reporter in Detroit, an assistant to Sean “Diddy” Combs, and a foreign correspondent for Marie Claire magazine. She earned her master’s degree from Harvard and has been to Djibouti. Siegel lives in Jackson Heights, Queens, one of the city’s most diverse neighborhoods, because it’s just like traveling even though it’s home.